Sampurna has translated Sukumar Ray, the master of Bengali nonsense poetry and prose, loved for his word-play, his absurd and all-too human creatures, and his crackling humour. 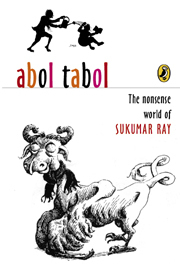 Abol Tabol: The Nonsense World of Sukumar Ray was published in 2004 by Penguin Books India under the Puffin imprint, and quickly went into a reprint. In July 2008 it was reissued with a brand new cover and an Introduction by Ruskin Bond as a Puffin Classic titled Wordygurdyboom! “What Edward Lear and Lewis Carroll did with English, Ray could do with Bengali. Readers were treated to a cascade of humorous verse, satire, wonder tales and just plain nonsense. … But no less entertaining were Sukumar’s drawings – his sketches of fussy schoolteachers, errant schoolboys, pompous pundits, eccentric family members, and of course weird creatures such as the animals in Professor Chuckleonymous’s hunting tales, or the wild-eyed monster with an elephant’s trunk, a lion’s mane and a lizard’s tail. The creatures he created for his poem ‘Mish-Mash’ are truly out of this world. But some of his humans are among my favourite characters – the rascally schoolboy Pagla Dashu, the inventive Uncle with his crazy gadgets, and Tickling Tom who drives you crazy with a feather. 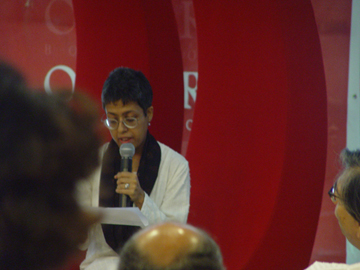 The translator Sampurna Chattarji deserves a medal (and more) from Chandidas’ Uncle … She has given the upside-down world of Sukumar Ray a new lease of life. This is obviously a labour of love, and thanks to her labours there are now many readers who will love this wonderful world of nonsense. Rare is the literate Bangali who does not smile at the mention of Upendrakishore Roychoudhury and Sukumar Ray. About Goopy Gyne and Bagha Byne Satyajit Ray, grandson of Upendrakishore and son of Sukumar, wrote to Marie Seton, “It is extraordinary how quickly it became part of the popular culture. Really, there isn’t a single child in the city who doesn’t know and sing the songs (from the film).” The same can be said of Sukumar’s Abol Tabol, although his work has more adult resonance than Upendrakishore’s. Sukumar’s satirical characters include children who have been forbidden from smiling (a dig at the extra-seriousness of the members of Brahmo Samaj), and an anglophile cow that loves everything English (a depiction of the black sahibs who viewed with contempt anything Indian). In a dig at the laws of the then British government, Sukumar also described a land where one can be punished for coughing or sneezing or slipping on the road. Puffin India, which is a subsidiary of Penguin India, has published these two very good translations of both the writers – especially of Sukumar’s Abol Tabol, whose translator Sampurna Chattarji notes that, “The most marvellous thing about Sukumar Ray’s poetry is, of course, the sound. What we call onomatopoeia in English suddenly starts seeming pale in comparison to the whole riotous caboodle of effects that he conjures up in Bengali. My effort has been to get that experience across, even if it meant resorting at times to outrageous word-making.” The reader can read the results for him/herself. The stork told the tortoise, ‘Isn’t this fun! was it you who snored so gruesome? Must he give up insects and start eating chilli? If translating verse is a tough translation assignment, translating nonsense verse must be tougher still. 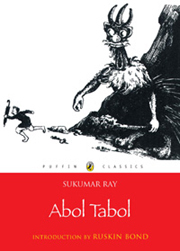 Sampurna Chattarji has, indeed, done a commendable job of translating Abol Tabol. Even so, non-Bengali readers cannot help wondering how much better the book must be in the original. Part prose, part verse, the common thread running through the book is its unbridled sense of fun. It has none of the staple ingredients of children’s books. There are no morals here, no preaching either. What you have, instead, is a roller-coaster ride with characters who are as fun as they are weird, as interesting as they are outlandish. With their simple charm and wacky wickedness, they can bring a smile to adults as easily as they can to children. You meet Wise Old Woody who sits in the sun “eating boiled wooden bits.” Or take a peek inside The Ol’ Crone’s Home where “In a rickety-rackety house, a clickety crone is stomping.” You can crack a joke but must not expect any response from “The Billy Hawk Calf (who) is forbidden to laugh.” You might want to run from Tickling Tom, though, because “If he catches you alone he feeds you tales till you’re a goner.” You will probably laugh yourself silly at the antics of two hunters named, hilariously enough, Hurly Singh and Burly Singh in The Diary of Cautious Chuckleonymous. Fortunately, Sukumar Ray has done strikingly accurate drawings of his out-of-the-world characters to go with each piece. These evocative renderings bring alive a never-never land that might otherwise have been lost on those unable to imagine bizarre characters in outrageous situations like the ones in Mish-Mash. Flowers blooming? I see! I thought they were crackers! You mean that’s a pretty smell getting out of here? Hurry-scurry clunk-thunk — what’s that dreadful sound? Can’t you see the dew falling, mustn’t move around! Critics call this use of sound onomatopoeia — but never mind unpronounceable literary terms, Ray would have probably wanted it known as jolly good fun. If each of his verses has a couple of fun-filled fantastic characters, the stories, especially Haw-Jaw-Baw-Raw-Law and The Diary of Cautious Chuckleonymous, have a whole assembly of them. Though shorn of the acoustic gymnastics that make the poems so remarkable, the stories are nonetheless unforgettable for their bewildering array of madcap characters in the unlikeliest of situations.